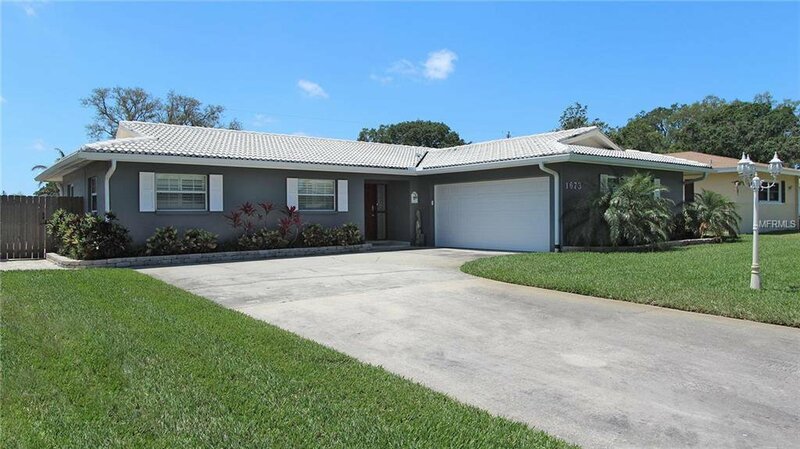 Beautifully renovated pool home in the heart of Clearwater! Just minutes from the best shopping, beaches, and airports! Open floor plan living with beautiful wood floors. Spacious kitchen with granite counter tops and stainless steel appliances. Updated bathrooms and large rooms. A heated saltwater pool with a new salt system cell. The house sits on a well that the irrigation system uses so you don’t have to pay for reclaimed water. Relatively new air conditioning unit with high-end thermostat. Brand new Anderson windows that assist with low energy costs and beautiful plantation shutters throughout. The entire gutter system runs underground and out to the street to avoid standing water in the yard. Spotless garage with NEW Hurricane grade door, professional landscaping and pavers throughout the private backyard which also has a new shed for additional storage. No Flood insurance require and No HOA fees. Come live 10 minutes away from Clearwater Beach! Listing courtesy of COASTAL PROPERTIES GROUP. Selling Office: RE/MAX METRO.